At the request of the Georgina Historical Society, the Town of Georgina passed a resolution in 1974 setting aside ten acres of land as the permanent site for what would become the Georgina Pioneer Village & Archives. Officially inaugurated by Chief of the Chippewas of Georgina Island, Lorenzo Big Canoe, on Thanksgiving Day, 1975, the Village opened with two buildings: a backwoods log house constructed circa 1870, and a Free Methodist Church built in 1889. A succession of buildings has been moved to the Pioneer Village between the late 1970s and 1999. 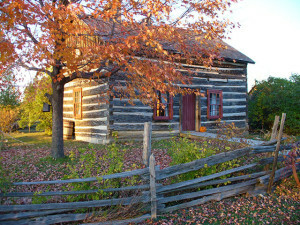 Located near the south shore of beautiful Lake Simcoe, this ten-acre site is now home to sixteen structures that interpret the rich history of Georgina between 1850 and 1920, including a one-room schoolhouse, a general store, a train station, a blacksmith shop, an apothecary, among other significant historic structures. The Archives at the Georgina Pioneer Village is comprised of records created by the councils of the former townships of Georgina and North Gwillimbury, as well as the Village of Sutton. These records date back from 1850 to about 1970, and include council minutes, petitions, by-laws, account books, general correspondence, assessment and collector rolls, and various other documents created by the previous municipal councils. The Archives also contain a large number of personal family documents, including land records (deeds, maps and plans), photographs, scrapbooks, bibles, diaries, letters, and related ephemera. The records of many former clubs, groups and businesses can also be found here. The reference collection contains published material relevant to Georgina, news clippings, scrapbooks, family trees and histories, as well as family files compiled by members of the Georgina Historical Society since its inception 40 years ago.